The presence of numerous players in all the regions has triggered a highly competitive environment in the global lab on chips market, states Transparency Market Research (TMR) in a research report. 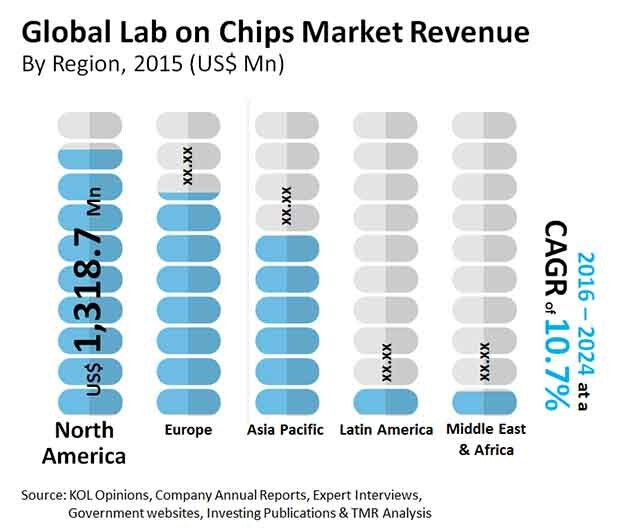 Nevertheless, the lab on chips market exhibits a high consolidation degree with the leading 8 players holding approximately 80% of the total share in the global market in 2016. The crème companies operating in the global lab on chip market are Abbot Laboratories, F. Hoffmann-La-Roche AG, Thermo Fisher Scientific, and Danaher Corporation enjoying dominance owing to their diverse product portfolio and extensive geographical reach. Other than this, numerous companies are focusing on strategic collaborations in order to strengthen their position in the market. The players are also investing in research and development activities for innovation in technology and enhance the current technologies. For instance, the introduction of the microfluidic technique back in the 1990’s has been supporting the growth of the market since then. Thus, players are seeking to invent technologies as such to gain further. Based on product, the global market for lab on chips can be segmented into consumables, instruments, and reagents. Amongst these, the segment that led the market with a share of 45% in 2016 is instruments. The dominance of this segment can be attributed to adoption of microfluidic products in labs and industries. Other than this, the progress which has been exhibited by the consumables and reagents segments is probable is continue at a favorable pace. Region-wise, the global market for lab on chip has been classified into the Middle East and Africa, Latin America, Europe, Asia Pacific and North America. Among all these region, North America emerged as the leading regional segment in 2016 closely trailed by Europe. In spite of North America leading in terms of consumption, Asia Pacific is expected to present riper opportunities to market players in the near future owing to advancements in technology and rising population. Expanding industries in Asia Pacific is expected to enable high consumption of microfluidic techniques. The advent of in-vitro diagnostic technology and Point-of-care devices has helped companies to manufacture high quality microfluidic products and chips. Furthermore, in demand for lab on chips is expected to rise in emerging economies in Latin America and Asia Pacific in order to meet the unmet medical needs in these regions. Activities that are being undertaken for the miniaturization of bio analytical technologies provides advantages such as enabling of analogous operations for the purpose of multiple analysis, less expensive, and compact design for devices. Driven by these factors, the sales of lab on chips is anticipated to accelerate in the coming years across the globe. Furthermore, microfluidics also aid in the transformation of top lab protocols into an individual chip. This facilitates diagnostics along with making home healthcare convenient. Such advancements are expected to trigger the growth of the global market for lab on chips in the coming years. However, the growth of the market might be affected by the existence of strict regulatory approvals.